I get asked frequently by clients of what exercise they should be doing on holiday and when I started out as a PT, I would write them a plan but stopped doing it as nobody followed the program. 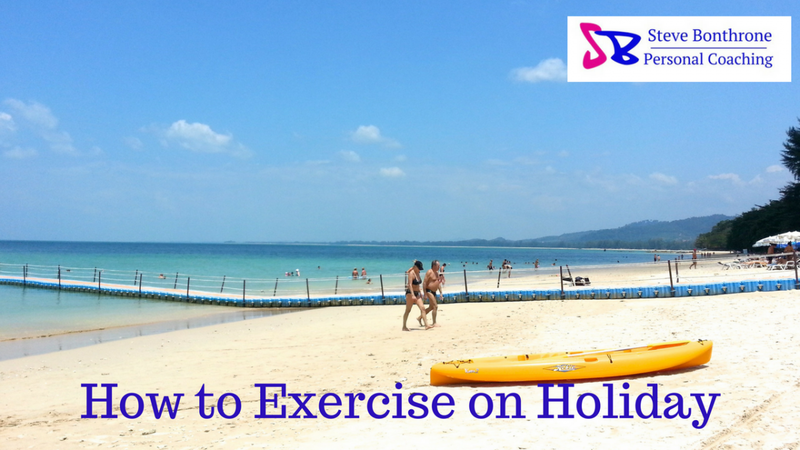 There are a few questions around this – what exercise to do, should we do exercise on holiday etc so here’s my guide on how to exercise on holiday. What kind of holiday is it? Before we can answer the question of what to do, we have to look at what kind of holiday you’re going on. Is it a beach holiday? Are you going to be sightseeing? Is it an active holiday? If it’s an active holiday ie cycling, hiking, running etc then you’ll already know what you should be doing. If you’re going to be doing a lot of sightseeing then you’ll be active enough so won’t need any further exercise, likewise if it’s a family holiday with young children. I always recommend doing any kind of exercise outdoors. Stay away from any hotel gym and get out in the fresh air! I always like to go for a run on the first day anywhere I go to get my bearings and also to get to see the place. You can obviously go for a walk and achieve the same thing and the main thing is, you can save yourself a lot of time by doing this. If you’re on a beach holiday, go swim in the sea or go for a run/walk along the water’s edge. Most beach resorts have a marked off area to swim in so I would stick with that. I always recommend getting up and out early morning to do any exercise. I still wake up early morning even on holiday and this is a great time to get out. I would say to aim for between 6 and 7am so you can get out and back before it starts to get too hot. You can always cool off in the pool afterwards (if you have access to one obviously!) and feel good for starting the rest of the day whether you’re going to be doing anything or just sunbathing. We can have the desire to exercise to maintain our fitness and it can be easy to forget the whole point of why we’re on holiday. While we may want to exercise, it’s essential to allow ourselves the time and space for our bodies (and mind) to relax and recover so we can perform at our best when we get home again. While we train well at home, we’re not going to lose much fitness if we allow ourselves a lie-in or some relaxation by the pool or on the beach etc. If you’re going to run or swim etc then I’d recommend lowering the intensity, after all the last thing we want is to pick up an injury on holiday! Holidays are for enjoying yourself and spending time with this you’re with. You’re welcome to do some exercise but try not to let it take over your time away. Instead of doing the same things you always do, why not try doing something different like watersports or something else that’s available to you that you maybe haven’t tried before? This can often be more fun and more meaningful than doing the same old things you already do at home. These are the tips I recommend from personal experience and from what I recommend to my clients. I would find it dull if I went on holiday and tried to do the same things I do at home and so wouldn’t expect anyone else to either. The main thing is to look after yourself. Let the main thing be enjoying yourself and having fun with those you’re on holiday with. You can choose to eat the healthiest foods you can find but there’s nothing wrong with having things you wouldn’t normally have at home. My wife and I normally go to Florida and like going out for pancakes for breakfast a couple of times, the odd treat when we’re out and usually a couple of beers when sunbathing and wine with dinner. We can always work it off again when we get home! Do you exercise on holiday or do you prefer to completely relax? What’s your favourite thing to do while you’re away?